The Technoline BL-700 battery charger is probably the only battery charger you will ever need and is certainly one of the very best battery chargers ever made. The BL-700 has four independent charging channels each of which allow for independent charging, discharging, refreshing or testing of any AA or AAA rechargeable battery, both NiCd and NiMH. 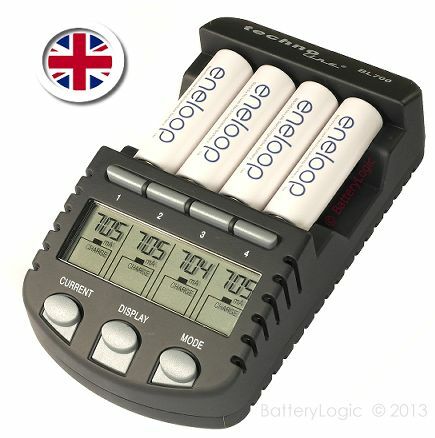 Perfect for charging odd numbers of batteries or for charging batteries which are not always used and charged in sets as the individual battery monitoring provides spot on charging every time. Each battery compartment has its own LCD display which provides real time information relating to the status of each individual cell. You can view actual charge/discharge current, terminal voltage, accumulated mAh and elapsed time per cell. This unique charger has four modes of operation : Charge, Charge/Test, Discharge and Discharge/Refresh. You can perform different functions on each battery simultaneously. You can set the charge current at different levels for each of the four batteries and you can also charge different sizes (AA or AAA) and different technologies (NiMH or NiCd) at the same time. You can select the charge current of your choice for a gentle or fast charge at either 200mA, 500mA, 700mA. This charger is also perfect for matching batteries into similarly performing sets and does an excellent job of identifying failing cells within a set. some example charge times ..